Australian tech companies that tap into the Government’s research and development tax incentive (R&DTI) scheme to boost their bottom lines look set to come under increased scrutiny as the Government prepares to crack down on R&D tax breaks. Australia’s Treasurer Scott Morrison handed down the Federal Government’s Budget 2018-19 on 8 May, outlining a number of strategies aimed at improving the “integrity” of the country’s tax system. Among these is a “refocusing” of the R&D tax incentive -- which is often employed by the likes of independent software vendors (ISVs), larger IT providers and global vendors operating locally -- to make sure the scheme is used for its intended purpose: encouraging local innovation. “We are cracking down to ensure that R&D tax incentives are used for their proper purpose, with enhanced integrity, enforcement and transparency arrangements, saving taxpayers $2 billion over the next four years,” Morrison said in his Budget speech. Specifically, the Government said that the 2016 review of the R&D scheme found that the program is failing to meet its objectives of encouraging additional R&D and generating the associated flow-on benefits for the national economy. In response, from 1 July 2018, the Government will move to better target the incentive program through a new R&D premium for companies with turnover of $20 million or more. “This will ensure support for larger companies is directed towards those companies undertaking additional, high-intensity business R&D,” the Government said in its Budget papers. The Government also said it will impose a cap of $4 million on cash refunds and convert the rate of the R&D tax offsets to a premium above each claimant’s company tax rate. Administrative and compliance improvements aimed at helping to improve the ongoing sustainability, transparency and integrity of the R&DTI will also be implemented. The Budget papers revealed that the Government expects payments to the R&D Tax Incentive program to decrease by $237 million in 2018-19, and $1.4 billion over the four years to 2021-2022. Such changes to the country’s R&D tax incentive scheme have been top of mind for some players the local industry. The Australian Information Industry Association (AIIA) – the peak body for organisations in the local digital ecosystem, including IBM, Google and Microsoft – suggested that the R&D tax scheme should not be viewed as a cost that needs to be cut, but rather valued for the benefit it can bring to the economy. Responding to the R&D tax incentive crackdown, Reckon A/NZ managing director Sam Allert said, “It’s disappointing to see that the government has decided to restructure the R&D Tax Incentive". "This will have huge implications on many Australian small businesses that rely heavily on the tax concession to drive research, development and innovation, as well as start-ups who do not have the capacity to work on projects with a substantial R&D spend above industry peers," Allert said. “Along with these changes, the ATO will now be able to publicly disclose those who requested R&D relief and what the relief was for, as well as impose a limit on time extensions to complete R&D registrations and amendments to technical provisions," he said. At the same time, the Government revealed plans to introduce further measures aimed at ensuring that digital businesses pay their fair share of tax in the country. These measures follow the introduction of other legislation such as the multi-national anti-avoidance law and the diverted profits tax, both of which came after scrutiny of multi-national companies operating in Australia, including the likes of Microsoft, Apple and Google. 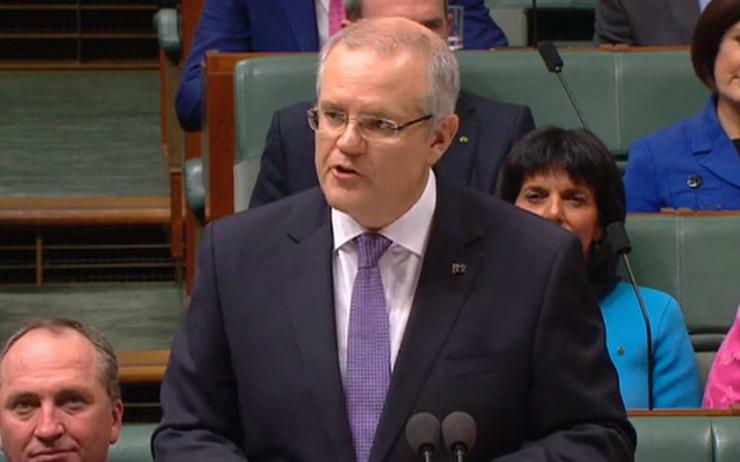 “We will close down another tax loophole…that gave foreign companies a tax break over Australian companies, by changing the tax treatment of stapled structures,” Morrison said. “We are also further tightening thin cap rules to stop multinationals from fiddling with how they account for debt, to reduce their tax liabilities. “The next big challenge is to ensure big multinational digital and tech companies pay their fair share of tax,” he said. Morrison said that in a few weeks' time, he will release a discussion paper that will explore other options for taxing digital business in Australia. While the measures see the Government try to wrest tax from tech companies operating locally, other Budget measures see the Government work to ease the tax burden on other players in the local market, specifically those falling into the small- to medium-sized business (SMB) category. Indeed, the Government has already legislated tax cuts for around 3.3 million Australian SMBs across all industry verticals, as part of its Ten Year Enterprise Tax Plan. The tax cuts began in 2016‒17, with companies claiming annual turnover less than $10 million having their tax rate cut to 27.5 per cent. This lower corporate tax rate was extended to companies with annual turnover less than $25 million in 2017‒18 and will be extended to companies with annual turnover less than $50 million from 1 July 2018. The Tax Plan has also increased the unincorporated small business tax discount rate from five per cent to eight per cent (up to a cap of $1,000), a rate that will increase to 16 per cent by 2026‒27. “By lifting the small business entity turnover threshold from $2 million to $10 million, access has also been extended to a range of small business tax concessions,” the Government said in its Budget papers. The Government also said it will extend the $20,000 instant asset write-off for SMBs it first announced in the 2015 Budget for an additional year, to 30 June 2019. Applicable businesses will be able to reinvest in their business and replace or upgrade their assets.